If you are looking for themes for a party why not try an old classic? Circus themed party’s have been around for decades and for a reason, there are fun and allow your guests to enter into a mysterious and magical place if only for the afternoon. Try out some of these ideas for your next circus themed party. 1. Get Creative – You don’t have to have exotic or expensive food to keep your party in character. Try renaming plan items to put a twist on your menu. 2. Menu – Serve the classics! What food reminds you of the circus? Remember walking into the county fair and you instantly get the feeling you had the previous year when you smell the kettle corn and hot dogs. A major part of a memory is scent so since no one really enjoys the barn smell you usually smell at the circus let’s bring them the more appetizing scents like corn dogs, popcorn and pretzels. Having an old fashion popcorn maker would be a great splurge. 3. Petting zoo – If you can afford a real zoo with the exotic animals one would see at the circus try a regular petting zoo. If you are having a party for children create your own petting zoo with stuffed animals. Create exhibits for stuffed animal zebra, elephants, lions and giraffe and let the kids become the “circus keepers” by letting them groom, feed and water there exotic animals. 4. Props – Create easy picture perfect opportunity by creating fun props for people to use. Spray paint styrafoam dumbells to let kids feel like a heavy dutty weight lifter. Have a top hat and red jacket for the circus master, paint a wood board to look like rope and secure it 6 inches off the floor to let kids pretend to be trapeze stars. 5. 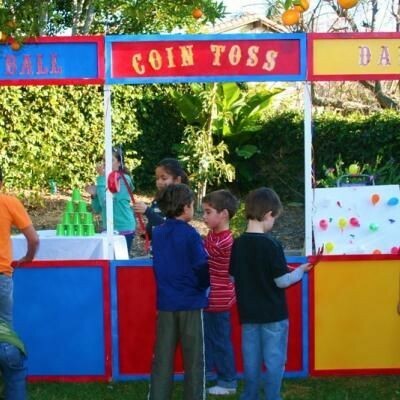 Archade – No circus is complete without ring toss, ball throw and ???? . Set up stations and give out prizes to winners and/or participants as party favors. 6. Decorations – stick with the basic colors of the circus Blue, white Red and Yellow. Pitch a tent – if your budget doesn’t include having a real tent drape red and white striped fabric as a background or create a low hanging shelter over the food. Hang string across the room, or if outside across two trees, and hang trapeze artist. 7. Check out My Pintetest – You can get additional ideas for decorating on my pinterest board. Not sure what one wears to a circus themed party? Let me give you some ideas.